Weirdest Coin Pusher Win EVER! Check out Marvin's Marvelous Mechanical Museum: http:www.marvin3m.com Subscribe to DJ Bwellz: https:www.youtube.comuserxuc4leb2 Follow me on instagram: https:www.instagram.comarcadejackpotpro I'm ArcadeJackpotPro & today I'm in Michigan with Blake aka DJ Bwellz at Marvin's Marvelous Mechanical Museum where I go around playing very unique arcade games to see what I can win. I end up playing a game where you have to land a coin on a platform after it enters a tank filled with water. I win a t-shirt after the arcades worker shows me how to beat the game! Watch to see what other unique games I play. Thanks for watching, subscribe for new videos every week! My New Favorite Arcade! 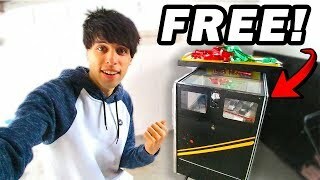 Playing New Games Winning Arcade Tickets! THIS ARCADE JACKPOT HAD ME SCREAMING at Playlist Live Orlando Arcade!